Posted in Arts and tagged British council arts, Filter Theatre, Oliver Dimsdale, Twelfth Night, UK on November 5, 2015 by Debesh Banerjee. Why is the production staged almost like a rehearsal? Why is it so minimal on stage? When we made the show we only had 10 days to rehearse it, and a limited amount of money. This limited us to a smaller number of actors and meant that we didn’t have the budget for an expensive set. That’s why we have double roles with some actors. “If music be the food of love, play on” is the first line of Twelfth Night. The play is about every form of love, and we interpreted that in as many forms of music and song too. We knew we were going to work with music and sound, the text, and the actors, so why make it any more than that? If there is a design, or a concept behind the rehearsal aesthetic of the show, it is that there is a band on stage. They are Orsino’s band, helping him to find that ‘strain’ that unlocks the key to Olivia’s heart. They are also the band in Olivia’s household – Feste’s band perhaps. In that respect all we need is the equipment that a band has. How did the idea of ‘Filter’s Twelfth Night’ come about? We got invited to go and be part of the RSC’s Complete Works after we’d performed Caucasian Chalk Circle for the National Theatre London, and they offered us a full rehearsal period. We said we’d like to approach Twelfth Night. Because there was no pressure on us, we were only going to do three performances up in Stratford for their Complete Works Festival and it was a tiny little footnote in the big, grand programme of the RSC. Twelfth Night’s definitely Shakespeare’s most lyrical play and Sean Holmes (the director) suggested that we use the Filter process to free ourselves of the shackles that can plague more traditional Shakespeare productions. The ethos was really ‘Let’s chuck the play into the room, add sound designers and brilliant actors and a me, and let’s just see what comes out of the process’, and sure enough sometimes when you’re using the gut and the heart instead of the head for inspiration, irreverent, interesting and dynamic things can come out of it. You started off with six actors. How did you go about casting it and making those decisions? A couple of suggested doublings from Sean were brilliant. The Fool and Maria (a double) both have huge vendettas against Malvolio and have good reasons to want to exact a revenge so at the point at which you see the Fool putting the nose on Malvolio at the end, there are echoes of Maria’s revenge as well in laying the letter down. Andrew Aguecheek and Orsino (again, a double) are both in love with the same woman, so there were many echoes which was the point. And the Viola/ Sebastian double is obviously a very tricky double, but we think it adds a really lovely ambiguity and innuendo, a ‘ménage à trois’ going on with all these people that are chasing one person. What is the significance of using so many microphones and sound technology? In our production of Twelfth Night we use the natural voice, the amplified voice (microphones), the distorted voice (reverberated through use of a ‘memory man’ distortion machine), and a pre-recorded voice (i.e. the Shipping Forecast on the radio). Sound is very important to Filter, though very often not central to many other theatre productions, where it’s very often tacked on to the end of a rehearsal process. Filter shows have sound design and music at the very heart of the action on stage because we work very closely with sound designers and composers. If you show the sound being created on stage, we think it frees the audience to think beyond the boundaries of theatre, whereas if you simply hear sound effects or music on stage whilst not seeing where and who is creating it, it feels like you are trying to con the audience that the play, or the scene, is happening in a particular period or environment. In Filter shows there is always a playfulness and an honestly about the relationship between the actor, the story and the sound designer on-stage that we believe is an exciting ‘live’ aspect to theatre. It’s about keeping the experience of theatre as live as possible, not always so pre-recorded, or second-hand. Why does the actor playing Sir Toby Belch wear traditional Elizabethan costume? The idea came from when I originally played Sir Toby 10 years ago. 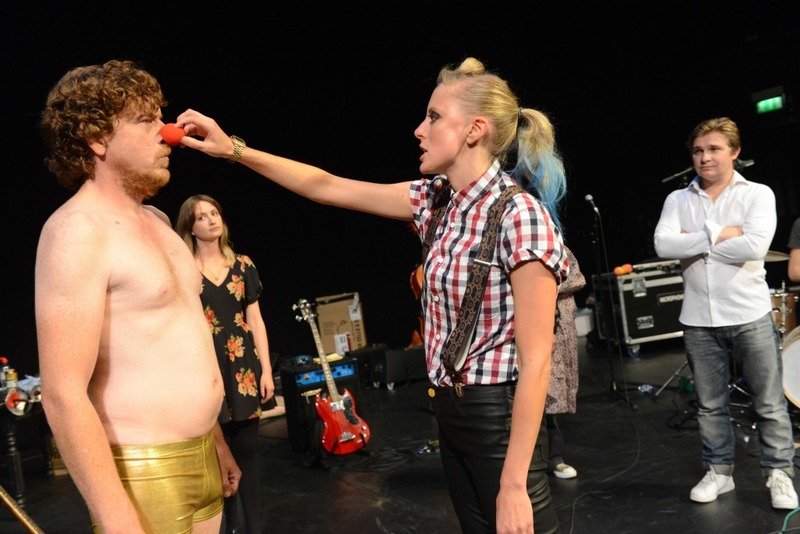 When we’d done the first performance, I’d been sitting around on stage, like the rest of the cast, in jeans and a T-shirt, and it just didn’t seem to work for me personally, as well as with Belch being an anarchic whirlwind who is constantly disrupting Olivia’s household, causing mayhem. So I took myself off to the RSC Costume department and fitted myself in a clichéd Elizabethan doublet and hose, and ruff. Nobody else knew about this, and no one on stage knew what I was going to do. I made sure I had a can of Special Brew (beer) and there was food hidden everywhere around the stage. During the performance I entered and exited the stage whenever I wanted to during the scenes. The really interesting thing about the experiment was that not only was it demonstrating the destructive element in Belch with Olivia’s household, but there was also the notion of there being the remnants of this 400-year-old text that we were speaking and that this is the way that it was done originally but with a bit of a twist because he’s got a can of Special Brew and he’s genuinely drunk. The play is about the madness and wonder of love. Every character is in love with, or loved by, another character, in many different ways. It is also his most lyrical play, and hence the amount of different types of music in our show. Where do you draw the line between interpretation and adaptation when approaching Twelfth Night? The play is called Twelfth Night, or What You Will, and the production draws inspiration from both the title and the subtitle. We interpret and adapt from the original, but never at the expense of the robust emotional heart of Shakespeare’s play. The first version of the production was a response to Twelfth Night, and in many ways that’s what it still is, but we are actually incredibly faithful to the linear structure of Shakespeare’s original play. 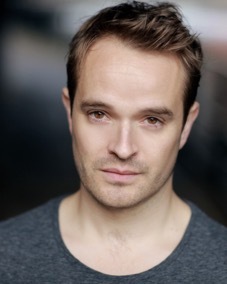 This post was contributed by Oliver Dimsdale, artistic director, Filter Theatre. 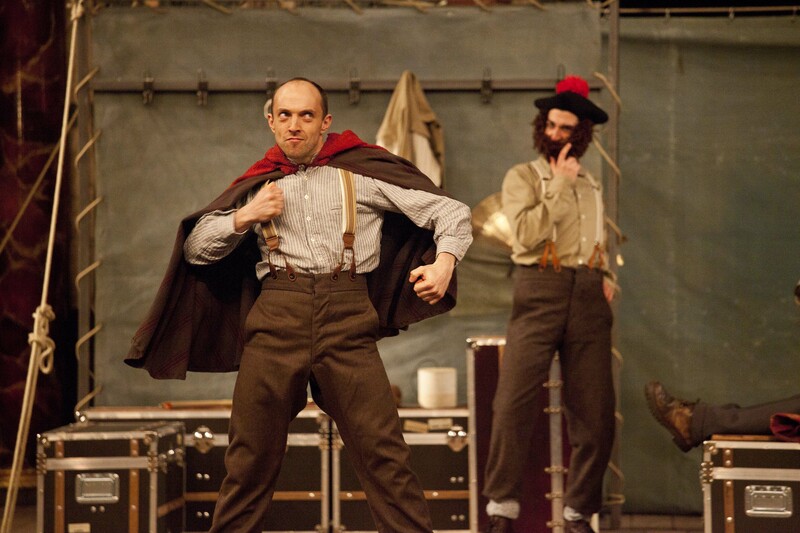 Find out about Twelfth Night tour dates in your city. Posted in Arts and tagged Bangalore, British Council, hamlet, London, Ranga Shankara, Shakespeare Globe Theatre, UK on October 6, 2015 by Debesh Banerjee. 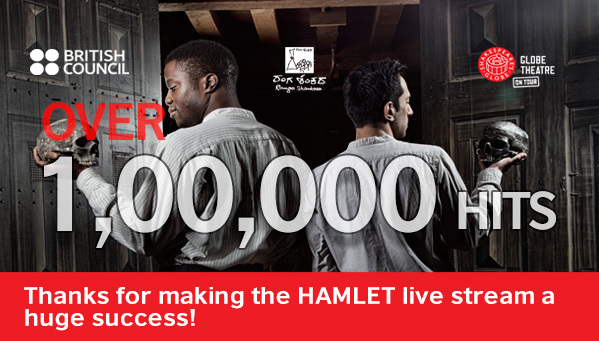 The British Council live streamed the production of Hamlet on 18 October, 2015 at 7:30 pm. The live stream is now over. 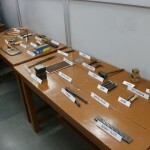 Posted in Arts and tagged Birmingham, British Council, fine jewellery making, Jaipur, NSDC, regional round, the Skills Show, UK, UKIERI, World Skills, World Skills India, World Skills UK on September 25, 2015 by Debesh Banerjee. Sixteen-year-old Sanjoy Pramanik, a jewellery artisan from Bangalore has come a long way – not just geographically but for also creating better opportunities for himself. Pramanik comes from a small village in the Hooghly district of West Bengal and never stepped foot outside his village, until one day a close relative introduced him to the jewellery industry of Bangalore. Now he is among the four shortlisted candidates who could represent India in the Fine Jewellery making competition in the World Skills UK, The Skills Show, to be held in Birmingham this November. This is the first of its kind opportunity created for India as part of a learning and skill building tour created by the British Council and supported by UKIERI (UK India Education and Research Initiative) in partnership with the National Skills Development Corporation (NSDC) to participate in the World Skills UK show. “I come from a small village where my father picks beetal leaves for a living and my mother takes care of the house. I do not have any elder siblings who can earn for the family this so I had to find work outside my village, in Bangalore,” says Pramanik, who recently got selected in the Finals of the regional rounds of the World Skills India held in Jaipur between 18-19th September. Pramanik has been in the jewellery industry as an artisan since he was 13 and works with a private jeweller in Bangalore creating bespoke pieces. Earning money was the best incentive for him to drop out of school. 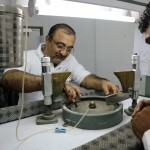 Ten participants competed in the regional Finals for “Fine Jewellery making” in Jaipur for a chance to represent India in the World Skills show in UK. Like Pramanik many of the participants come from lower-income families and earn a pittance for working long hours in an industry, which is full of untrained workers. Pramanik earns about Rs 4,000 a month, enough to support himself and save a small sum for his family in West Bengal. Dr Parag K Vyas, Chief jewellery expert, who has been training artisans in his Design Institute in Indore, points out an irony, “Most participants are from West Bengal. Even though they come and represent different regions but they are originally from West Bengal. There is a lot of talent in that State and not enough job avenues for jewellery skills.” Most artisans in this profession are girls because of the fine craftsmanship required in dealing with designing jewellery. Asrof Jamal is also no different from Pramanik. 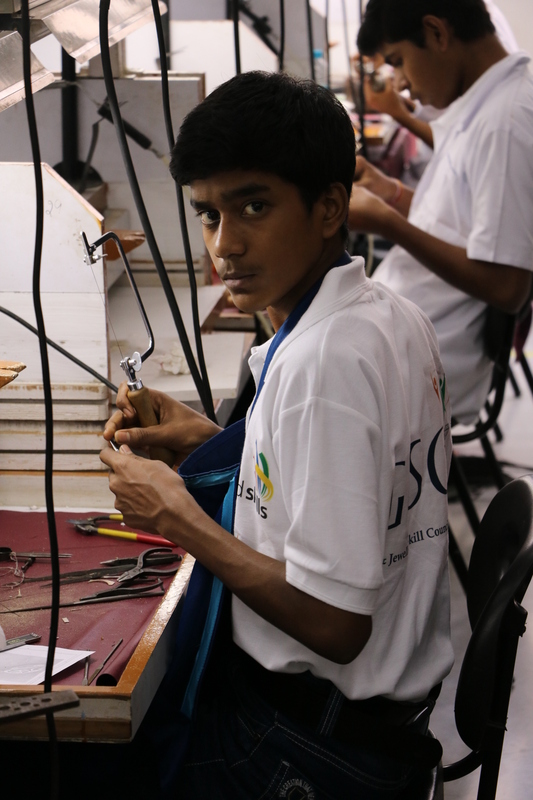 Pramanik and Jamal work in the same jewellery market district in Bangalore, though in different jewellery stores. Jamal, 16, moved to Bangalore leaving behind his parents in West Bengal’s Howrah district 3-4 years ago, in search of better livelihood. “I am paid Rs 8,000 a month for working long hours. I miss home and this competition will offer me the chance to do better for myself in this profession and support my family,” says Jamal, who is also among the shortlisted candidates for the World Skills UK in November. Ultimately two students will be selected after being groomed by Dr Vyas. Fine jewellery making skills are an important area when it comes to competition standards on the world scale, says Dr Vyas. Every two years the World Skills competition is held, which tests a range of skills including Fine Jewellery Making. The next World Skills competition will be held in October 2017 in Abu Dhabi. Though India has an upper hand when it comes to the wider global skills set, there is still a lot that needs to be done to train artisans employed in the Indian jewellery industry. Posted in Arts and tagged Alkazifoundation, Amalgamatedanomolies, British, BritishCouncil, Identity, India, Origins, photography, Photoukindia, UK on September 8, 2015 by Debesh Banerjee. The British Council India and ‪‎The Alkazi Foundation‬ have come together for a photo project titled ‪PHOTOUKINDIA – Origins that looks at works drawn from the shared history of both countries. The exhibition of the curated entries will open as part of the PHOTOUKINDIA exhibition on October 14 at the Gallery in the British Council, in New Delhi. Over the coming weeks, we will feature a new artist, their history with, and approach to photography. 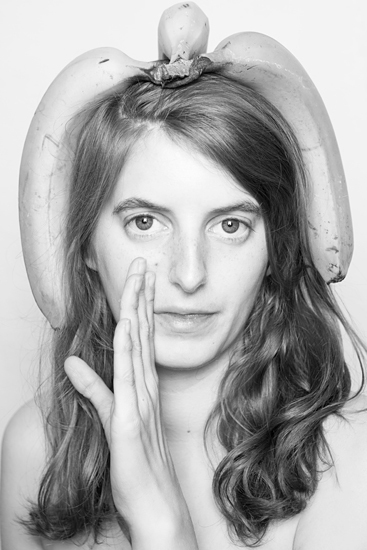 British photographer Jocelyn Allen looks closely at her work in taking self-portraits. “I’ve always taken self-portraits since I got into photography, but never did a proper project as on my BA I tried to make my projects non-personal until the last project where I decided to make the work that I really wanted to make. I didn’t plan to use myself originally but it seemed to make sense as I would be always be available and I had been taking self-portraits because I felt inspired but no one was around/I didn’t want to bother people. I didn’t plan to make another self-portrait project but I found it to be therapeutic, especially in terms of dealing with how I felt about myself and my body. Jocelyn Allen (b. 1988, UK) has a BA in Photographic Art from the University of Wales, Newport (2010) and an MA in Photography from the London College of Communication (2014). Highlights of her career so far include representing the UK in a Biennial of Young Artists of Europe & The Mediterranean (2011), showing her work at Guernsey Photography Festival (2011), self-publishing a book (2013) and being selected for FreshFaced+WildEyed at The Photographers’ Gallery, London (2015). 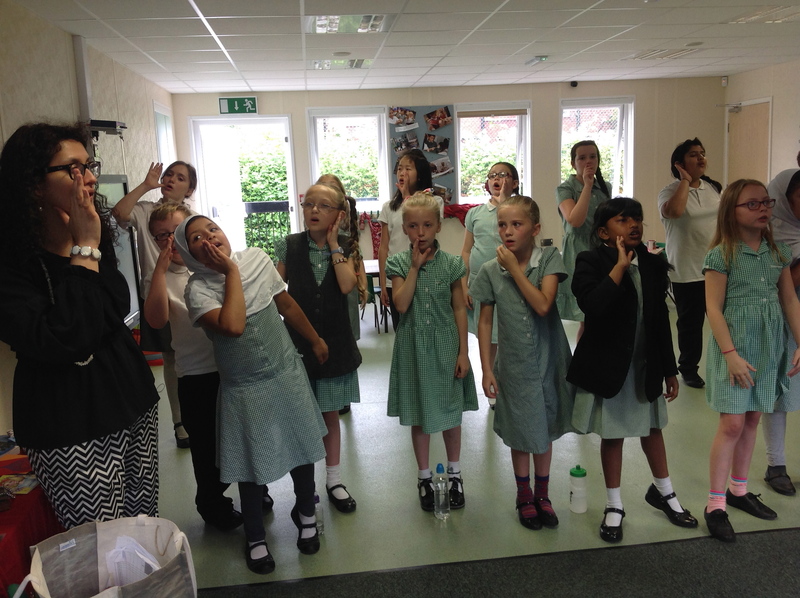 Posted in Arts and tagged amharic, arabic, British Council, Cale Green primary School, Manchester, Manchester Residency programme, pahadi, St. Joseph's Primary School, UK, University of Manchester, World Voice Project, WVP on August 26, 2015 by Debesh Banerjee. The week-long Manchester Residency programme, brought together master trainers from nine countries with World Voice UK trainers and vocal leaders from the Greater Manchester Music Education Hub (GMMEH). Each of the overseas master trainers’ worked in a ‘celebration school’ chosen from nine boroughs of Greater Manchester — Bolton, Bury, Rochdale, Tameside, Wigan, Stockport, Oldham, Trafford and Salford. 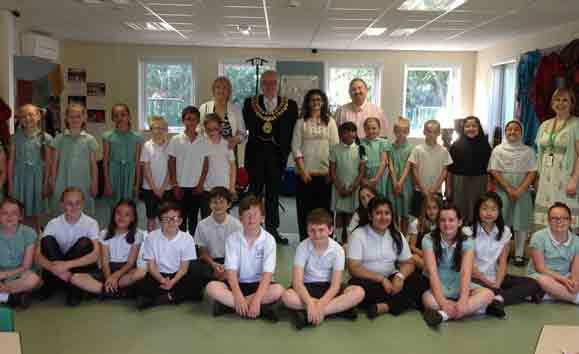 I worked in the borough of Stockport with students from Cale Green Primary school, whom I taught a song in the pahadi language spoken in Himachal Pradesh, India. The students also learnt about some Indian musical instruments and some features of north Indian classical music. There were also one-off workshops in other schools in Stockport — Mersey Vale, Prospect Vale and Back Lane Primary schools. 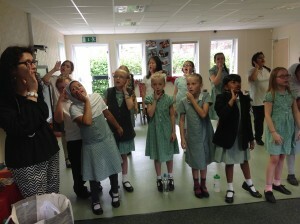 The World Voice Project aims to promote learning through song. By learning a song from a different culture and using it as a springboard into the learning of various aspects of that culture and country made learning much more joyful. One could tell by the twinkle in the students’ eyes and the complete focus with which they learnt the song, asked questions and also by their impeccable behaviour. I also had the opportunity to observe some activities carried out by the Stockport Music Service — like observing a Guitar Wider opportunities session in progress and also attending a squad performance by children at St. Joseph’s Primary School. It was a privilege to be invited to performances by the GMMEH brass band and “It’s a Musical World” event at the Macron stadium in Bolton, where many schools from the borough of Bolton participated in and presented music from cultures as diverse such as the Carribean, Colombian, native American and South African, among others. On the final day of the residency, we had performances through the day at the University of Manchester, with students from every celebration school from the Greater Manchester region, performing the songs they learnt from India, Jordan, Palestine, Senegal, Nepal, Ethiopia, Chile, Brazil and Argentina. They even sung local songs and a number specially written for the World Voice Project called Starlight. It was incredible to watch so many young children from the UK sing in different languages — Pahadi, Amharic, Wolof, Arabic, Spanish and Nepali, which they had picked up within a matter of four sessions. The experience was and deeply moving, re-iterating for all to see, the immense power of music and song in cutting across barriers of language, culture and all other markers of difference and creating sheer joy, a positive inquisitiveness into lives’ and cultures’ different from one’s own and a sense of remarkable achievement. Posted in Schools and tagged education, India, Schools, UK on December 2, 2014 by Shonali Ganguli. The British Council is holding a week-long series of programmes around schools education in Delhi which began on 28 November with the international launch of its global publication Innovations in Continuing Professional Development for English Language Teachers followed by a conference on Quality Standards in Education on 29 November. On the third day of the Schools Week, 27 Inward Study Visit Delegates from Saudi Arabia, Vietnam and Taiwan visited Indian schools to observe the Indian curriculum in schools systems. The delegates were first taken to the Jawahar Navodaya Vidyalaya (JNV) at Karnal which is a government-run residential school. This school, where 75% students are from rural and underprivileged backgrounds, is run by the Ministry of Human Resource Development, Government of India. 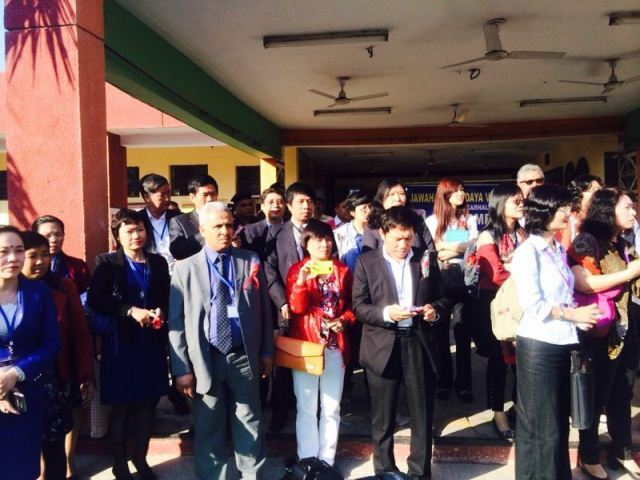 Schools Inward Study Visit Delegates from Taiwan, Vietnam and Saudi Arabia at the JNV School, Karnal. 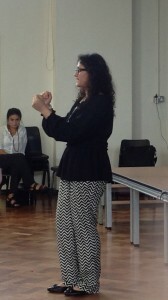 The delegates were taken on a tour of the school and were explained various aspects the school system and the curriculum being followed through interactive sessions with the school authorities who also acknowledged the Connecting classrooms programme by British Council and its positive impact. The Connecting classroom programme is also a part of their annual report. Next, the delegates were taken to the DLF School at Ghaziabad which is a recipient of the Global School Enterprise awards. This is a privately-owned school and markedly different from JNV Karnal. The principal of this school presented to the delegates the ways their association with British Council in the last five years has enabled them gain international exposure and build their capacity. The contrast between the schools covered in the visit gave the delegates a view of the socio-economic range that Indian school system spans and of the adaptable model that runs equally well for rural and urban set-up of the education system. Posted in Re-Imagine: India-UK Cultural Relations in the 21st Century and tagged British Council, India, Re-Imagine, Summit, UK, Youth on August 29, 2012 by Shonali Ganguli. A month and a half ago when I was informed that I was selected for Re-Imagine Edinburgh Youth Summit, I was elated that I would be visiting the city at the time of Fringe and Edinburgh International Book Festival. Yes, I had thoughts about my contribution in the summit and if it was possible for a group of 12 young people to define a vision for UK-India Cultural Relationship in just 4 days. But, mostly, I was excited about attending the festival. Over the course of the summit my expectations completely changed. On the first day when I met the other 11 participants (Well, I met 2 of them on my way to Edinburgh), I was a little bit skeptical, because of the sheer fact that we came from 12 different backgrounds. Of Course we had similar interest and some of them were part of changemakers, but we all had different agendas or so to say issues that we were supporting. We were told that over the next three days we would try and envision UK-India Relationship and highlight the areas of possible partnership. On Day 4 we had to present these outcomes to various stakeholders. By the end of day 1 my expectations had changed, I started absorbing a lot more about our shared cultural history. In the next four days I learnt a lot of things both consciously and sub-consciously. One of the first exercises we did was to visually depict what we were proud about our country. A question that I hadn’t answered before, call it arrogance, ignorance or insecurity. I am proud of certain individuals and emerging sub-cultures but I am not a patriot. The summit actually motivated me to see beyond my experience and discover things that I love about my nation. On the first day, we visited National Museum of Scotland. One of the most interestingly curated museums I have ever been to. The idea was not to segregate it by period/era but by themes. The museum is not just easy to navigate through, but it also creates an image that you can remember. They have used personal stories to highlight history, one that I particularly remember is that of Jean Jenkins (1922-1990), a renowned broadcaster and museum curator whose passion was capturing and sharing music traditions from across the world. The gallery allows you to learn more about Jenkins’ travels, listen to recordings, and even mix your own global music track using our World Music Composer. In India we don’t have any academic course on art curation, it’s not a mainstream subject that we consider important. But clearly it’s something that needs attention. Museums are accessible but are not interesting for us as students, because what we are taught in our history books is remotely close to our day-to-day lives. One of the major points of discussions was that India and the UK share a diverse cultural history and the fact that British ruled India hardly holds any relevance in current times. Our education system doesn’t highlight how India’s culture has influenced the UK and vice-versa. Museums play a vital role in providing information about the same. We all felt that it was important for us to strengthen documentation and curation in Indian museums as well as promote exchange of exhibitions between the two countries. In the past, curators from the both the countries have collaborated; but I believe that it is important, particularly in India to engage young people in that process to foster interest in cultural relationship. As part of our presentation, me and another participant from India, Arpita Das decided to make a short video about what people from both the countries think about UK-India Cultural relationship, we went around in Edinburgh asking people what were they proud about their country, what they liked about the other country and if they thought UK-India cultural relationship was important to them. While most of them were deeply interested in knowing about the other country and felt that it was important for the governments to invest in cultural initiatives, there were bunch of citizens from both the countries who weren’t really interested in cultural relationship. One of them even felt that we knew enough about each other’s culture and it might be irrelevant to invest further. Embedded media — click here to see it. Going out and interviewing people was a reality check for us. We might feel passionately about investing in cultural relations but does it hold any importance for people who live in smaller cities and rural areas, who have bigger struggles and concerns? How can we become more curious about each other’s cultures? Currently, we don’t have answers to these questions and it might be impossible to find an absolute answer. Therefore, it’s important for us to start from somewhere. As one of the participants, Heather Kitt mentioned that we shouldn’t take UK and India’s cultural relationship for granted and that we should invest in innovative programmmes that creates an open environment for people from India and the UK to communicate and learn for each other. These are the values that we feel are important to create a quality relationship between the two countries. Posted in Re-Imagine: India-UK Cultural Relations in the 21st Century and tagged British Council, culture, Edinburgh, future, India, Re-Imagine, Summit, UK, Youth on August 27, 2012 by Shonali Ganguli. Before the ReImagine Edinburgh Youth Summit, I admittedly was not entirely sure about the project’s aims. After listening to the keynote address on the India-UK relationship given by speakers from the British Council and Edinburgh University however, I started to comprehend why we do need to think about the relationship, my understanding of which grew over the time of the summit. With a history spanning over 400 years, the relationship between India and the UK is full of intricacies; there have been many victories and failings along their journey together. The relationship has seen many shifts of power, from being partners in trade to the deeply troubled Colonial relationship; from the long awaited independence to the eventual emergence of India as a power, with Britain slowly becoming a supplement. One cannot deny that the UK-India relationship has seen periods of reinvention and rethinking. Now the question remains – where is their shared journey taking them through the 21st Century? When rethinking the future, one must celebrate what has been achieved. This is what the British Council’s ReImagine Project is all about – it’s looking at the relationship between the UK and India in the past, and where it is in the present, to inform where it is going in the future. The project involves research, publications and debates, with input from 12 participants at the Edinburgh Youth Summit providing the youth perspective to the project, after all it is our generation that will be living the future relationship between the UK and India. Looking at the present relationship, it cannot be doubted that so much of India is ingrained in British culture, and so much of the UK’s culture is intertwined with Indian culture – from food (after all chicken tikka is the UK’s national dish), to language (hands up if you put shampoo in your hair this morning) or to sport (cricket anyone?) and so many other countless areas of life. The relationship has produced some crucial elements of who we are in both cultures. Nonetheless there remains potential for both cultures to continue benefitting from a relationship – perhaps the most straightforward reasons for a stronger collaboration in an increasingly globalized world include that it is vital to have strong relationships between countries for economic growth and working jointly towards advances in science and technology. Though perhaps one of the most overlooked and important reasons to consider UK-India cultural relations and their future is because there are plenty of people from an Indian heritage living in the UK and vice versa. Although we have a wonderfully diverse and multicultural society, the truth is that prejudices, apathy and hate do still exist in some parts of society and therefore must be challenged. Once these obstacles are fully broken down, the relationship between India and the UK will bring countless more benefits to all aspects of society and culture. The ideal relationship would be a mutually beneficial one, essentially a diverse, informed, integrated, open society that cooperates for the overall betterment of both countries’ societies. We explored a variety of different routes into achieving the vision we aspire to – the key routes including history, education and soft power. I’ll dedicate a section to each of these areas in which I will combine a summary of our discussions with some of my own points of view. Whilst speaking at the Edinburgh Book Festival, A.C. Grayling highlighted that education is about relationships with other people. In a way, the more we learn, the more we want to learn, the more you learn, the more you think – this sums up why education can play a key role in rethinking India-UK relations – after all to fight prejudice and nurture openness we must be direct in the way we teach India-UK relations, how else can people rethink India-UK cultural relations if they are taught nothing about it, if they have little to no awareness of how the two cultures interweave and share a long history together? There is no doubt that education changes mindsets, and indeed mindsets do need changing. For instance, the amount of people that asked me whereabouts in India I come from the moment they met me troubled me, then in response to informing them I’m from the UK, the usual response is “No really where do you come from?” I was born here, I’ve lived here my entire life and want to grow old here – how can someone think its acceptable to tell me directly I’m “really from” somewhere else? This is a mild example, but it shows that preconceptions do exist in people’s mindsets. Preconceptions and prejudices are enemies to a successful relationship. By reminding each other about either the UK or India’s influence and importance in the other’s culture in an honest and unbiased way we can celebrate how far relationship has travelled, our diversity and accept openness. Language is also an effective way of understanding another culture. In the UK, few places teach the Sanskrit languages. Though English is one of many Indian official languages, surely we can have greater access and understanding of the great Indian philosophers if we could speak some Hindi for instance. The importance of study exchange programmes was also highlighted – whilst many Indian students come to the UK to study, very few British students will travel to India to study, and this is something we felt needs to be explored. It is important that cultural education starts with the youngest in society, but it cannot end with the youth either. The importance of celebrating our shared culture and history needs to be reinforced throughout education, and needs to reach the greater society. The problem with the way history is taught in both countries, and most likely all over the world, is that it is biased – essentially the educator will teach their version of events (or at take the stance they have been told to teach). The Indian delegates at the summit said there is too much focus on Gandhi for instance, though there were many other vital figures that played a strong part in India’s independence and that there are political motives underlying the current curriculum. In the UK, it is important to have an education about the UK’s relationship with India, yes it may be uncomfortable, but after all that history was made by the actions of different people of a different time, there needs to be open discussion of it to it so there is a mutual respect and understanding between cultures. For instance, few school children in the UK learn about the soldiers of the Commonwealth nations who died fighting for the Crown, and this is something that must be highlighted. One cannot deny the importance of soft power when it comes to working on relations – this describes a nation’s power to attract people through a variety of mediums including through culture, political values and foreign policy for example. Soft power primarily through traditional cultural mediums, is something we considered very carefully after our visits to the Scottish National Museums and to the Edinburgh Book Festival. Museums indeed provide a distilled snapshot into the culture of a country, and we felt UK-India cultural relations could indeed benefit if there was an exchange of museum exhibitions from the UK to India to which the wider public should have access, arguably it is difficult to accurately portray culture in a confined space. The director of the Edinburgh Book Festival suggested that, “each book, like a small mirror, reflects a small facet of the world” and we felt that British school children should be encouraged to read the literature that Indian schoolchildren read, and vice versa. The director also highlighted that most Indian literature that is widely available and popular in the UK tends to be written by authors with privileged backgrounds, so suggested encouraging a greater diversity of Indian authors should be introduced to the wider market. Being in Edinburgh during the Edinburgh Festivals demonstrated the importance of drama, music and literature festivals in offering the opportunity to express often unspoken issues. It was suggested there should be an exchange of museum exhibitions from the UK to India – to which school children and teachers, as well as the wider public should be provided. Sporting culture is a key area that was discussed at the summit as now, more than ever, is the perfect time for sport to be used as a medium to place the focus on UK-India relationships. Between now and the next Olympic games, the Commonwealth Games will be coming to Glasgow and it is in these games that India have traditionally excelled. The group discussed the possibility of “sports exchange” programmes, similar to study exchange programmes, as well as increasing access to opportunities to participate in culture specific sport, for instance Bollywood dancing in the UK, and perhaps Gaelic football in India. Whilst we discussed many innovative ways of rethinking and strengthening the relationship between India and the UK, one cannot deny that there are major obstacles to be faced. Some of our biggest challenges include the practical issue of funding and the more complex problem of apathy. Though there are obstacles, even where we can’t face them head on, there’s nothing to stop us trying to, or moving around them and finding alternatives. For instance, when it comes to Study Exchange programmes, in our connected world there should be nothing stopping us from participating in study programmes using the Internet. When tackling apathy however, there is a need for a paradigm shift, with education (particularly of history) playing a key part in this. Additionally, this may be where soft culture can come into play, by highlighting the aspects of each other’s culture in every day life and increasing opportunities to access sport, art or food in each other’s every day culture, perhaps we can start turning the wheels of appreciation for culture in society. For our discussions on apathy, do have a readhere for more in depth details. This is a mere summary (albeit, still a long one) of what we touched upon during the Edinburgh Youth Summit 2012, however whilst reading this you might have come up with your own thoughts, which you’re invited to share and inform the ReImagine project. So come join the dialogue at http://reimagineyouth.posterous.com/ or by emailing reimagineyouth@posterous.com. Posted in Young Creative Entrepreneur and tagged creative, economic, ecosystem, entrepreneur, entrepreneurship, India, industries, investment, investors, UK on November 29, 2011 by British Council India. Posted in General and tagged Active Communities Network, All India Football Federation, British Council, British Council India, Commissioner of Kolkata Police, Crystal Palace Football Club, East Bengal Club, Football Clubs, Future Hope, General Secretary, George Telegraph Sports Club, Government of West Bengal, Indian Football Association, Jeremy Browne, Kick-off, Kickz, Kolkata, Kolkata Goalz, Kolkata Municipal Corporation, Kolkata Police, Kushal Das, Madan Mitra, Mayor of Kolkata, Michael Nyarko, Mohammedan Sporting Club, Mohun Bagan Athletic Club, Police Athletic Club United Sports Club, Premier Skills, R K Pachnanda, Rob Lynes, Rubel Ahmed, Shibtala community, Sovan Chatterjee, Sports Minister, Topsia, UK, UK Foreign Minister, West Bengal on July 21, 2011 by British Council India. 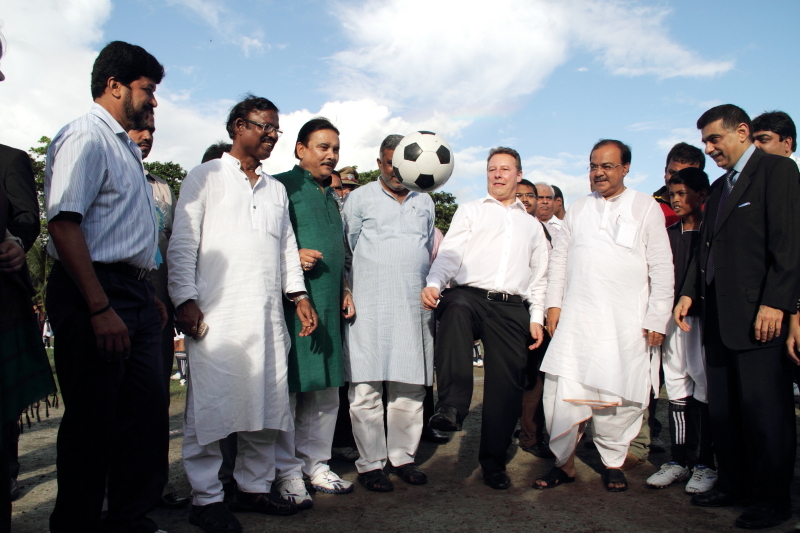 On a hot and rainy July afternoon inKolkata,UKForeign Minister Jeremy Browne kicked a football into a muddy field at Shibtala community ground in Topsia, one of Kolkata’s more deprived neighbourhoods. For the three hundred youngsters who had gathered there, it marked the beginning of a chance to change their lives through the game. 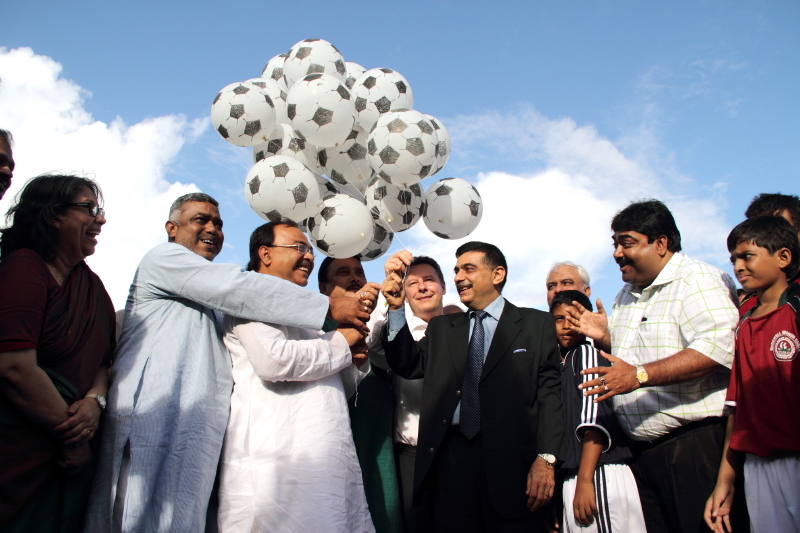 Minutes later, Madan Mitra, Hon’ble Sports Minister, Government of West Bengal, Sovan Chatterjee, Hon’ble Mayor of Kolkata and Rob Lynes, Director British Council India took turns to kick balls to the coaches and young people on the ground, signalling the launch of Kolkata Goalz, an inspirational initiative by the Premier League and British Council to encourage young people from across Kolkata to aim for a more positive future. 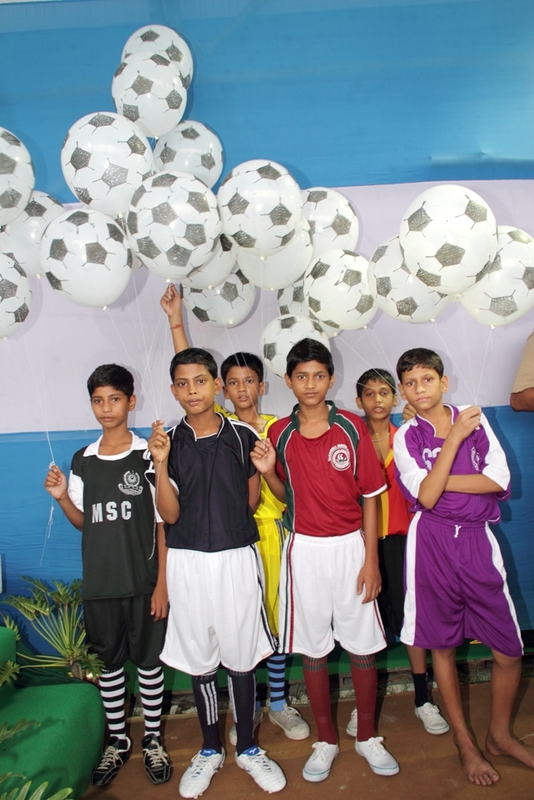 Kolkata Goalz is a new strand of the Premier League and British Council’s hugely successful Premier Skills programme, which uses football as a tool to engage with and develop the skills of young people. It is inspired by and modelled on the groundbreaking Kickz programme in theUK, a partnership between the Premier League and Metropolitan Police that targets youth at risk in deprived parts ofUK. 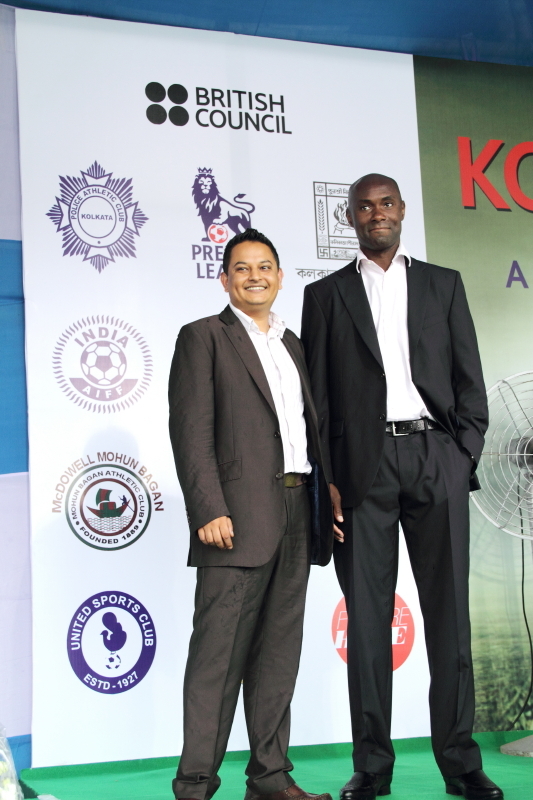 In Kolkata, the project has been launched by the Premier League and the British Council with the Kolkata Police, Kolkata Municipal Corporation, All India Football Federation and Indian Football Association (West Bengal) in association with six Kolkata Premier League Football Clubs, who will directly be involved in the delivery of the project. The six Premier League Clubs are Mohun Bagan Athletic Club, East Bengal Club, George Telegraph Sports Club, Mohammedan Sporting Club, Police Athletic Club and United Sports Club. Children’s charity Future Hope will support the project in an advisory capacity. This is a project for young people in difficult areas. 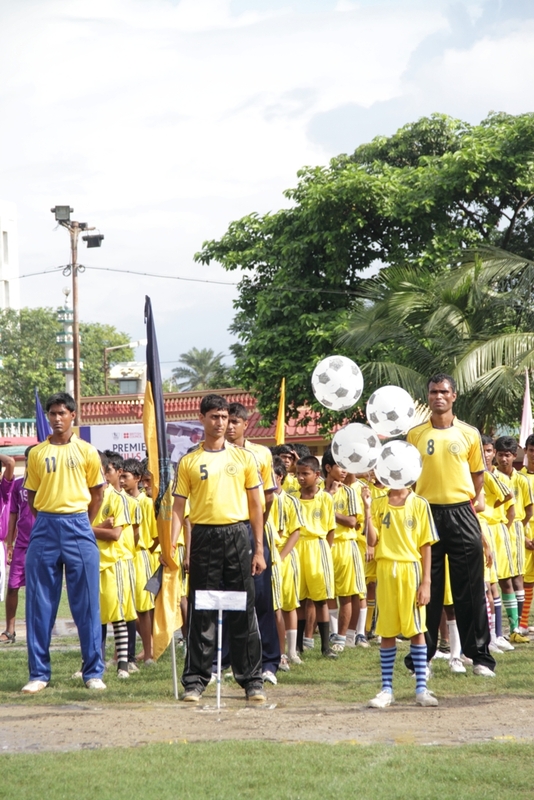 Youngsters in the age group of 12 – 18 years will join the programme. The youth, identified by the police, are those at risk, and in some of the most deprived parts of the city. Kolkata Police have selected six neighbourhoods in Kolkata where the project will be piloted and helped in selection of the youths. The Kolkata Municipal Corporation is providing the ground and infrastructure for the project in these areas. The clubs have provided their most experienced coaches who will train the young people in the neighbourhoods, thrice a week round the year in the evenings in football and engage with them in a range of other constructive activities. The coaches involved in the programme underwent a three-day Induction training with Rubel Ahmed from the Active Communities Network and Michael Nyarko, the Social Inclusion Manager of Crystal Palace Football Club, both of who work with the Premier League. In this intensive but fun training programme the coaches focussed on the essence of community sports, worked on a delivery plan, learned through role play about engaging, challenging and mentoring hard to reach young people and techniques of developing volunteers. The trainers also stressed on the importance of monitoring and evaluation to measure success. “In this room we are all experienced football coaches but you have opened our eyes to social inclusion through community sports. We will try our best to apply the learning in the training sessions with the young people,” said Kalyan Chaubey, former Mohun Bagan and India goalkeeper, speaking on behalf of the Indian coaches while thanking the trainers. Speaking at the launch, Rob Lynes, Director British Council India thanked the partners for joining hands to achieve the key objectives of the project. R K Pachnanda, Commissioner of Kolkata Police thanked the British Council and Premier League and reiterated Kolkata Police’s support and commitment for the project. Kushal Das, General Secretary, All India Football Federation, speaking on behalf of the football fraternity, wished the project all success and committed their support. Sovan Chatterjee, Hon’ble Mayor of Kolkata representing the Kolkata Municipal Corporation lauded the Kolkata Goalz initiative and said he was happy to support the project by providing the infrastructure. Madan Mitra, Hon’ble Sports Minister, Government of West Bengal commended all the partners and stated that the Government of West Bengal was delighted that the project was being piloted in Kolkata and that his department would extend all possible support to make it a big success. 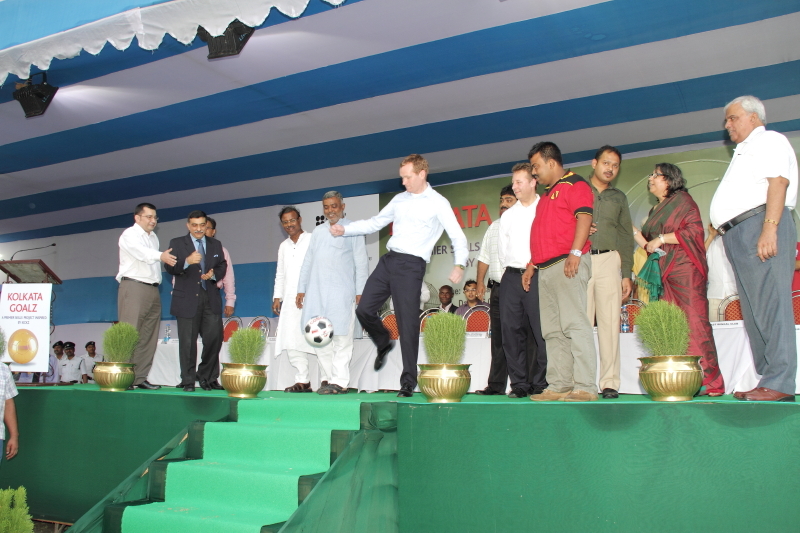 Speeches over, dignitaries took turns to demonstrate their skills in football and kicked the ball to the coaches and young people in the ground. 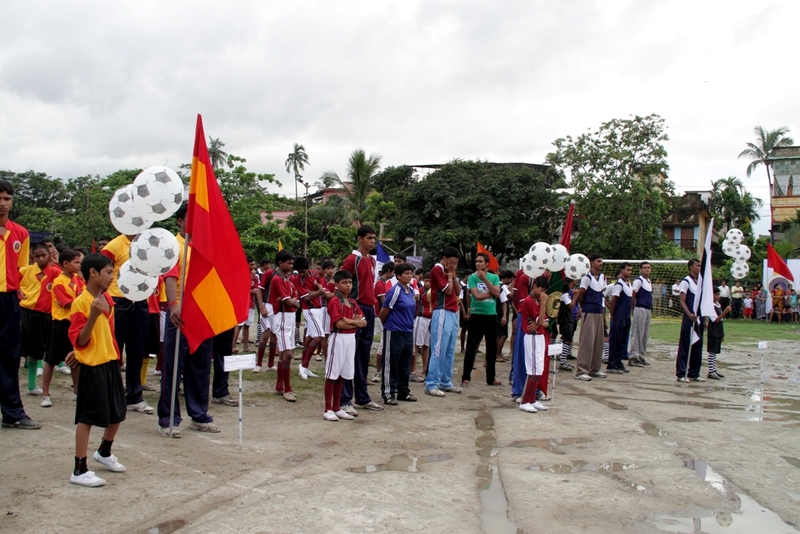 The coaches then gave a mini-demonstration of their coaching techniques with the young people. The training will begin soon at the six venues. As the young people wait excitedly to join the programme, we at the British Council wish the project all success. Our endeavour will be to set up a sustainable model in Kolkata which could then be potentially replicated across India in collaboration with other police departments, municipal authorities and football clubs. We hope that in the future we will be able to encourage young people from across India to aim for a more positive future.